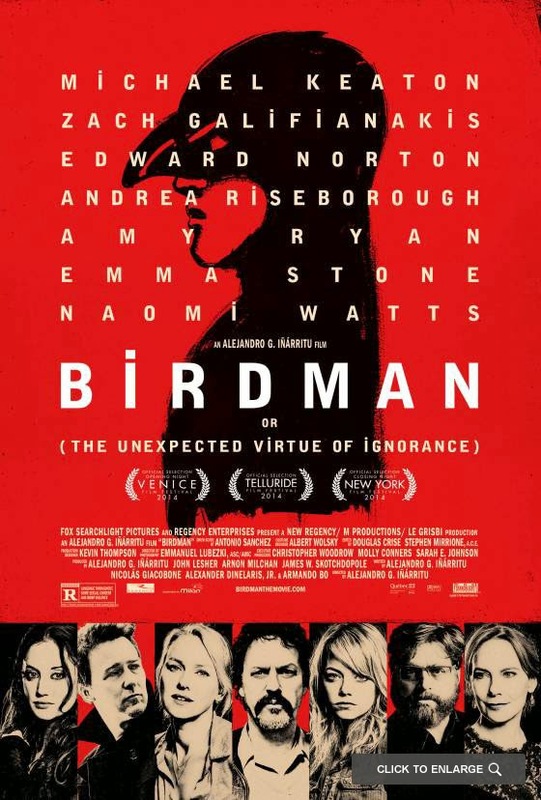 I'm not sure that I had a favorite movie of 2014, but if I absolutely had to pick one, it would be Alejandro González Iñárritu's Birdman, Or (The Unexpected Virtue of Ignorance). I told this story to most of my friends, but after hearing people rave about it for weeks after it came out, I finally decided to go see it on Saturday. Beforehand, I watched The Empire Strikes Back, because I hadn't seen it in a while and it's still the best Star Wars movie, no contest. By the time the credits finished rolling on Birdman, I had completely forgotten that I watched The Empire Strikes Back that day. All I wanted to do was find somebody who had seen Birdman so I could talk about it. It's the sort of movie that you want to talk to someone about, something I've seen in practice as friends have slowly gravitated towards Birdman. There are many films which inspired Birdman - Opening Night is an obvious example - but I can't think of any that are like Birdman. It's not the fluid camera, designed to appear as a series of single "takes," or the way that Iñárritu toys with what's really happening and what isn't - you can look at Rope or any film with an unreliable narrator for that. It's not the "washed up actor trying to reinvent himself" that sets it apart. Again, nothing about what happens in Birdman is really that novel, but something about the way that Iñárritu constructs the story, the way that the propulsive, seemingly improvised drumming goes from non-diegetic to diegetic and back again, the way that Birdman seems to exist in our world but simultaneously in its own universe. Something ephemeral about the film, that makes it so unlike its obvious cinematic precedents. It's hard to describe, but when you're watching it, you can tell. The sensation is clear: this is not like everything else. His producer, Jake (Zach Galifianakis) is already at his wit's end when Riggan blithely informs him they'll be recasting, but fortunately Lesley (Naomi Watts), one of the female leads, is dating Broadway bad-boy Mike Shiner (Edward Norton), who just happens to be available. He learns fast, has strong opinions about the material, and Riggan likes the challenge, so he joins the cast. He immediately hits it off with Sam (Emma Stone), Riggan's daughter, who's working as his assistant in order to be around her father. This does not appear to be her idea, but it's a place where she can stay sober and under his supervision. Mike and Lesley are having issues, Riggan is dealing with self-doubt about being treated as a "serious" actor, and Sam couldn't care less. On with the show. In addition to Opening Night, you could point to Noises Off!, State and Main, or any "theatrical / Inside Hollywood" based narratives, and there are other, stranger references, like the carpet from The Shining figuring prominently into the background, or the similarity of the opening credits to Pierrot le Fou, or Iñárritu's persistent references to Hollywood blockbusters. The elephant in the room is Michael Keaton playing an actor who walked away from a comic book movie franchise, but what's more interesting to me is that all four of the film's "name" stars have been in films based on comic books: Edward Norton in The Incredible Hulk, Emma Stone in The Amazing Spider-Man (she was filming 2 while Birdman was in production), and the one nobody remembers is one of Naomi Watts' first roles was in Tank Girl. That might explain the otherwise out of left field moment between Lesley and Laura (Andrea Risenbourgh), which is very reminiscent of a film Watts is better known for, Mulholland Dr. While I'm not entirely sold that it's the case with Watts and Stone, Norton and Keaton are almost certainly playing the versions of their "personas" that audiences assume to be accurate. I've heard that the fallout between Norton and Marvel didn't have anything to do with him being a trouble-making, egomaniacal tinkerer, but that's certainly the perception. Keaton has been working steadily since Batman Returns, but I guess most moviegoers haven't paid close attention to that, so there's a large contingent that believe Riggan Thomsen and Mike Shiner are slightly fictionalized versions of the actors playing them. I do feel like this is an intentional movie by Iñárritu, considering that many of the other actors he name-drops before Mike steps in are current stars of major franchises, but I'm not convinced it's some grand statement about art vs. commerce in Hollywood. At least, no more than it is about the divide between theater and film, and celebrity in general. Yes, it's hard to ignore the literal presence of people dressed like Spider-Man and Bumblebee of the Transformers near the end, but Riggan's conversation with Tabitha (Lindsay Duncan) seems to point at a broader argument than "blockbusters are bad." Tabitha is the big time theater critic in New York, and she's not shy about telling Riggan she's already torn What We Talk About When We Talk About Love a new one, sight unseen. He's a tourist to the stage, a pretender, leveraging his celebrity against the "serious" world of acting, and he'll be punished for it. He'll be mocked for it. Riggan retorts by tearing into criticism with the same fervor, using arguments that have existed for as long as there has been art and someone reacting to it. I'm not saying either of them is more right or wrong than the other, just that Iñárritu is more interested in exploring the various position within the world of acting and directing and criticism than he is in making declarative statements with Birdman. There's a lot to chew on in the movie, if you choose to, and I disagree with the sentiment that the film is trying to be "clever" and falls short. There have been reviews from people whose opinions I respect that hate the third act or don't feel that Birdman reaches its supposed "goals," but that's fine. People are talking about it, which is good. It's a movie to talk about. I have slowly been running out of superlatives over the course of this recap to convey how impressed I am with performances, which makes it difficult to describe just how revelatory Michael Keaton is as Riggan Thomsen. I don't think he's playing himself, and he's onscreen for almost the entire movie, in long takes, propelling Birdman forward. It's really a tour-de-force performance from him, and even if nothing else in Birdman worked, I could watch it just for him. I like how, despite the fact that Iñárritu keeps it ambiguous about Riggan's "powers," Keaton invests completely in Thomsen believing he has telekinesis. Even when he's clearly walking away from a taxi after "flying," he behaves like he soared back to the theatre (this is the part you've almost certainly seen in the trailer). The rest of the cast give what could be argued career high performances as well. Only Naomi Watts isn't given much time to register, but Norton, Risenbourgh, Stone, and Galifianakis are better than I've seen them. Amy Ryan has a small, mostly thankless role as Sylvia, Riggan's ex-wife, but uses her little time onscreen to be anything but the stereotype that part could be. Lindsay Duncan similarly owns what amounts to a cameo as the critic, withering and cynical that she may be.